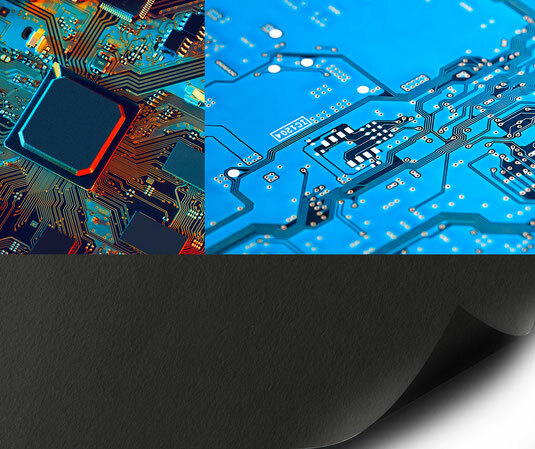 Specialty papers in the form of electrical insulation paper are indispensable in modern electronics – although they are barely visible there. Electric laminates can be found in a wide variety of devices: for example, in calculators, household appliances and consumer electronics. In addition, electrical insulating papers are also used in the automotive industry. This type of specialty paper is indispensable in the production of batteries, cables and printed circuit boards. Hoffsümmer manufactures electrical insulating papers as white or gray base paper or in different forms according to the individual requirements of the customer. Our electrical insulation papers are always impregnable, insulating and guaranteed pure and safe. The grammage weight range of our electrical insulating papers starts at 40 gr/m². This type of specialty paper is interesting for manufacturers of printed circuits, among others. Applications include XPC, FR-1, FR-2 and CEM 1 circuits. What are the advantages to Hoffsümmer electrical insulating paper? Highest purity due to the low salt content of the paper. Ion exchangers allow even further reduction of the salt content. By using different pulps, cotton, linters or glass fibers, we can manufature custom grades. Hoffsümmer is one of the leading producers in Europe of bleached insulating papers.